Aptly named German black metal band Chaos Invocation have led an existence of perpetual pandemonium. With reaping season recently announced, we explore a journey through parted flesh and broken bones – violence fixation and judicial interference. – This world has been placing obstacles in our path ever since we first started CHAOS INVOCATION. Sometimes it’s the minor inconveniences that are the most annoying. Take technology for instance, every single electrical device in our rehearsal room has broken down at least once – or at least temporarily stopped working – more often than not while used on stage or during recording. We’ve also had problems with studio equipment that doesn’t belong to us; microphones suddenly giving up, computers breaking down, etcetera. Guitarist and second vocalist A mentions how the 2011 recording of their second album, “Black Mirror Hours”, serves as prime example of the typical technological malfunction-marathon they’re forced to endure. – After the guitars for seven out of eleven songs had been recorded, the soundcard gave up. A replacement was needed but all the shops had already closed and our studio-time was coming to an end. So, we couldn’t finish it and had no choice but to return – all seven-hundred kilometres I might add – two weeks later. Once the guitars were finally recorded it was time for vocals. Of course, the hard disk died after two lines which meant that we were once again unable to finish our work. It hasn’t only been faulty equipment causing delays; the 2009 debut album, “In Bloodline with the Snake”, was postponed a number of times due to their drummer being sporadically institutionalised for psychiatric care. – There was this incident featuring a gun… he could be gone for months at a time but replacing him was never a consideration, we were friends and gave him all the time he needed. The very moment recordings finally began I cut my pulse artery, nerves and tendons on my right wrist. Corrective surgery number one was unsuccessful so the hand stayed numb, which is why I had to undergo a nerve transplant several months later. Result? I now also have a numb foot. Learning how to play the guitar again took me half an eternity. To be honest though, I would question our work if we were to record and release an album without any opposition. All these obstacles show us that we’re on the right way – this world wants to stop us because we rebel and fight against its established structures. While I think every satanic band should get at least a breeze from this ‘headwind’, in our case it’s a hurricane at times. This curse also applies to the production process of their albums – so far there have been delays, misprints and so on for every single release. Furthermore, their ill luck occasionally takes a near-lethal turn. – M (vocals) and I got into a car accident on our way to rehearsals – we collided with a truck neither of us had noticed. One millisecond earlier and we would’ve been right in front of it and now dead. Perhaps we’re not a purely ’bad luck band’ after all, but it’s somehow symptomatic that something like this would occur in connection with band activity. As it happens, vehicular collision is but one of many misfortunes to befall them on the road. – Any random drug smuggler could transport his goods openly on the vehicle roof as long as he drives behind our bus. While he runs no risk of being stopped, I can assure you that we will be – after a maximum of two minutes on the highway, we’re usually made to follow a patrol car to the nearest police station. Guess who’s forced to unload the entire bus? Which is usually packed to the roof with various stage accessories, blood, and bones. At any border station, while the car in front of us is full of people being smuggled into the country, same thing. On the way to the first date of the Living Darkness Tour in 2011, we weren’t pulled over once but twice. As a result, M now has a criminal complaint for carrying a weapon and we had to answer some critical questions about human skulls. The same European tour brought CHAOS INVOCATION to Vienna, where they were scheduled to perform two consecutive dates. For one of the gigs, they appeared on-stage as a quartet instead of the customary five-piece. – Our bass player had to be rushed to the hospital following a suspected heart attack. It turns out that people who wear ’I HOPE YOU DIE’ patches on their jacket are not given waiting-room priority. Shortly thereafter our rhythm guitarist, J, collapsed but somehow managed to drag himself on stage. After two songs my amp went up in smoke and we ended the show because J was about to pass out again. Sometimes this world wins and there’s nothing you can do about it. Anyway, lately we’ve had a long streak of good luck – besides our rhythm guitarist suffering a complicated ankle fracture the day before the release party of our new album. Which brings us to “Reaping Season, Bloodshed Beyond”, CHAOS INVOCATION’s latest offering. – This band is a very emotional matter for me. The ’radius of impact’ of the subconscious is greater than we think and definitely includes our music. Some of the songs aren’t much younger than those on “Black Mirror Hours”, which makes it even harder to judge how much of a musical transformation might have taken place. Besides, our composition is a natural, uninfluenced process. I’ve never been the type of guitarist to spend hours working on new riffs – also, I never try steering our music in certain directions. Art should be an entirely honest projection of one’s true self. There are moments when certain things can’t be held back, much like a volcanic eruption; I use these moments to compose material. A CHAOS INVOCATION album will typically end up being shaped based on how these individual outbursts are put together. Of course, we’ve been developing on a spiritual level during the last few years and perhaps this made “Reaping Season, Bloodshed Beyond” what people are calling ’more progressive’, but who knows. The lyrics are characterised by own insights, experiences and visions; the core message is often obscured by the use of symbolism and metaphors. 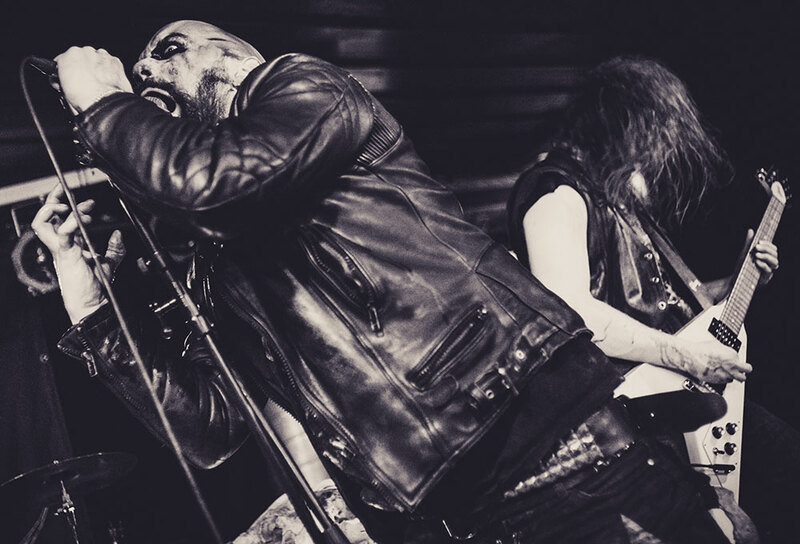 In 2016, two Italian gentlemen – bass player Tumulash and drummer Omega – became part of CHAOS INVOCATION. – We met at the Inner Awakening Festival in Budapest. It was already clear in advance that this would be the last concert of T. I knew Omega was a great drummer and wanted to invite him to join but he volunteered before I had a chance. We played that festival without bass because our live guitarist cancelled two days before the show; not for the first time but definitely the last. It took only a few words before I knew that Tumulash should become a part of us too. This guy is a black metal beast and also looks like a criminal, which is clearly an added bonus. The time we’ve spent together has already shown this new line-up to be ideal for CHAOS INVOCATION – very powerful, highly explosive, and with the necessary obsession and insanity in the approach. A hails from a small rural community in western Germany’s Rhineland-Palatinate region, near Hachenburg. I’m curious how someone in pre-internet age discovered underground metal in such a secluded habitat. However, it took a few more years before they first established contact with black metal. Fittingly, it was the same day that A, at fourteen years of age, purchased his first guitar. – I’d brought a friend – C, now the drummer of AVE MARIA – along with me to Cologne as moral support. After buying the guitar we still had time to spare and so headed to a big record store. There was a music shop not far from our hometown but its metal selection was very, very limited. We went through the shelves and suddenly held DARKTHRONE’s “Under A Funeral Moon” in our hands. C bought it without knowing what it was, just because we were fascinated by the cover and its pure, direct presentation of death. Back home under the shadows of the Westerwald mountain ranges, A began practising his guitar while C listened to the album. – He called me the next day and demanded that I come by his place at once. We listened to the record together and both agreed: this was the hardest thing we’d ever heard. The music radiated a completely different feeling, it was much more aggressive and cold than any other metal we knew. Shortly thereafter, we met a guy from our village who had some black metal records. He made us a list and offered to record them on cassette. So far, the classic story. It didn’t take long before they were made infinitely aware of just how different black metal as a sub-culture is and those drawn to it really are. At a local party, A and M spotted AD – who later went on to become the CHAOS INVOCATION drummer. Metalheads were extremely rare around their area so they decided to engage him in conversation. – Well, what can I say – we were quite naive. AD was significantly less interested in talking and, following a short verbal dispute, stuck M in the stomach with a short pocket knife. Before leaving, he informed us that we’d all be found gagged and dead in a ditch the next morning. The optimal start of a friendship, I’d say! Then when M and I changed schools at the age of sixteen, we met H. He looked normal enough but had MAYHEM and MARDUK patches on his backpack, and promptly informed us that he hated metal guys but liked aggressive music. H was a very interesting guy and was later recruited as driver for CHAOS INVOCATION. He drove a black Mercedes with ‘we kill suckers’ written in big letters on the side – haha! Anyway, we became friends and got to know his circle of mates. A and M first met their new comrade’s cohorts in a bar. Initially, they deemed the new acquaintances to be ‘relatively normal’ and drank together in what first seemed to be an uneventful gathering. – Suddenly, one of the guys came back from the toilet with a bloody nose and the mood changed instantly. I could sense how the others had been waiting for something like this to happen. A few seconds later, a battered-looking man came out of the toilet, called his drinking buddies from the counter and off went the wild beating. M and I were still completely perplexed when it hit me – bang! The clash of a fist. Although I’d previously been in physical conflict, this punch was a new calibre. It quickly turned out that this scenario was the ideal of a successful weekend for these guys, they were absolutely erratic and we liked that. We began hanging out with them regularly and came to develop a taste for this tension that builds up when a conflict starts and the feelings flowing through you when emerging victorious from a beating. Both increased the desire for violence in us. Having attended concerts and festivals in Germany countless times over the last two decades, I’ve been given ample opportunity to study the natives. Among underground metalheads, I’ve noticed how it’s primarily the rural types who appear to be of a somewhat more unhinged inclination. – I think you’re generally less noticeable when living in a city. For example: you don’t just go to a pub here, have a brawl, go home, and the next day no one remembers. People will know what you did. When getting into a fight in the city, the next day nobody gives you more attention and you’ll probably never see your opponent again. Living in the countryside with a rebellious mindset or swimming against the current, so to speak, inevitably means that you’ll become notorious. So, being a metalhead was and still is a statement. 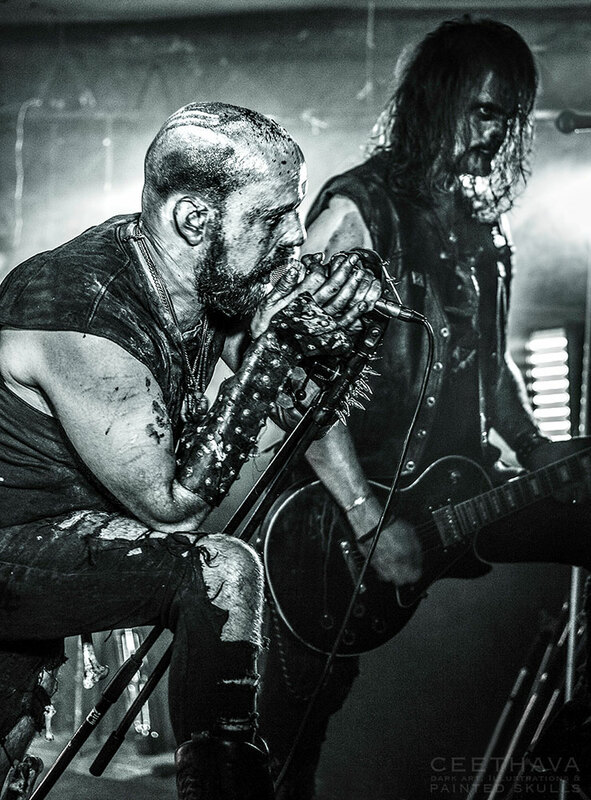 In our region, metal was always music for strong characters while the big-city metalheads often comprised of the classic weakling-outsider type – no friends, no girls, no whatever. When we started going to shows in larger cities, we usually fell out of line. Going to concerts was incredibly special to us, while for the townspeople it was commonplace. We always had significantly higher energy levels. What often annoyed me with urban people was their arrogance and this air of superiority they wanted to convey to us. Of course, we had to take this illusion away from them. A says that at some point, as they grew older, such violent excesses began losing their initial appeal – presumably coinciding with his increased interest in music and spirituality becoming life-determining factors. – Only a few things remain important when you start dealing with darkness, gods, and death. I’m an impulsive person, and there was a period in my life when I was very unbalanced and properly obsessed. I needed to set up some calm in my mind and tried to re-balance with meditation on the ajna chakra, which worked pretty well. The obsession has changed over the years and I’m able to work on my goals more focused now. If you want to establish communion with higher beings, you are well-advised not to do so completely unbalanced – at least that’s my experience. Those who’ve been following Bardo Methodology for a while will have likely noticed how a vast portion of my esoterically inclined interviewees at some point in their lives have experienced the condition known in medical literature as sleep paralysis. A considerable number of them refer to these instances as the catalyst for their interest in metaphysics and the proverbial ‘other side’. – I’m very familiar with these sorts of nightly encounters and since several years they accompany me with a certain regularity. It all started at the age of thirteen when I began reading Poe, Lovecraft, and others. Their stories had a huge impact on me and I wasn’t really surprised once I felt their influence on not only my mind but also the surroundings. The sound of creeping steps right before my bed along with feelings of being observed soon became regular nightly sensations. Even at this young age I was already convinced that the other side not only existed but is fully capable of reaching into our world. Of course, this belief was based on pretty naive and profane assumptions so it was pleasing to see these nocturnal activities all but confirm my suspicions. The term sleep paralysis caught his attention a few years later when he was researching his most recent encounter, which the night before had taken a more physical turn. – When I awoke, my legs were standing in an acute angle away from my body – fixed in the air by something. The ’scientific’ explanation for these incidents never satisfied me at all as it seemed to be desperately ’rational’. After experiencing the feeling of levitating in the air above my bed for the first time, I decided to consult some mediums. The answer was always the same: a shadow figure accompanies me, without a visible face but of enormous age. Since having this certainty I try even harder to find the metaphorical signs and meanings of these nightly meetings. What’s next for CHAOS INVOCATION? – After playing some of the most important festivals in Europe this summer, a European tour later this year, as well as recording some unreleased material we will now, for the first time in the band’s history, write and record an album that represents the contemporary state of CHAOS INVOCATION. I’m expecting a classic, direct, and intense record and cannot wait to get started. …the last delicious nightmare had me a lucid paralytic husk sprawled on damp dank vast basement floor in some forgotten asylum, firm immobilization in conscious prison of my dream self trapped in the black wetness. grey-yellow light unfurled toward my paralyzed position; a fat shadow filled the doorframe, and the form of some slug-like black-eyed nurse waddled forth, advancing closer, heavy footfalls splashing in the puddles throughout the basement, eyes aglow in neon ebony with rippling flesh of rot and wide toothy smile, the she-thing grew closer. By the time she squatted before me, slabs of rancid hands reaching out, the sound of my own inarticulate gurgling squawk forced my escape into the waking world and into my sleepy ears.